The Danish group N55 works with art as a part of everyday life. They started in 1994, when their non- commercial exhibition space and lab was opened in Nørre Farimagsgade 55, Copenhagen. Their operations are founded on a firm set of philosophical values: the rights and wellbeing of persons over norms, laws, and concentrations of power. They prioritize making use and sustenance over ownership and property. 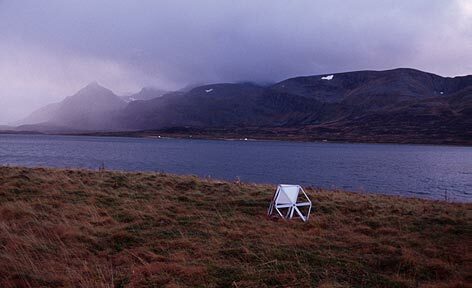 One of their flagship projects is LAND, a worldwide registry of spaces legally designated as commons, to be used and shared by everyone, the status of which is signified by portable cairns. N55 is renowned for continually making use of their architectural and artistic competence. Their constructions are built with low-cost materials that are easy to assemble by self-organized groups, using simple tools and leaving a small ecological footprint. They publish all their designs as open-source manuals that can be found on their website. The exhibition features one example of their recent designs XYZ SPACEFRAME VEHICLES (see: report), a series featuring low cost, lightweight, highly durable bikes whose construction requires only a do-it-yourself attitude, basic skills, and hand-held, non-specialized tools to produce. These vehicles are part of a wider series of designs, XYZ NODES, which also experiment with similar design principles and forms to construct basic public facilities. The report presented in exhibition consists of manuals and a bike loaned to the Museum of Modern Art in Warsaw for the duration of exhibition. Courtesy N55.